Hi! I’m so glad you’re visiting today! I’ve been struggling to make a layout work with the pictures I wanted to use and the die cuts that would help make it even more fun. Honestly, this page has been rattling around in my brain for the past 2 months and I finally had an “a-ha” moment on Saturday morning (when I first wake up is when I tend to solve “design problems” I might be having.) I figured out that in order to accommodate all my pictures in the sizes I wanted as well as the cuts I wanted to use I could use a grid format, similar to how Project Life pages are laid out but as a traditional page. With how my grid ended up, I had two perfect spots to put my die cuts. With a rectangular piece of patterned paper behind, they read like a Project Life style card, only with dimension and some added embellishments! 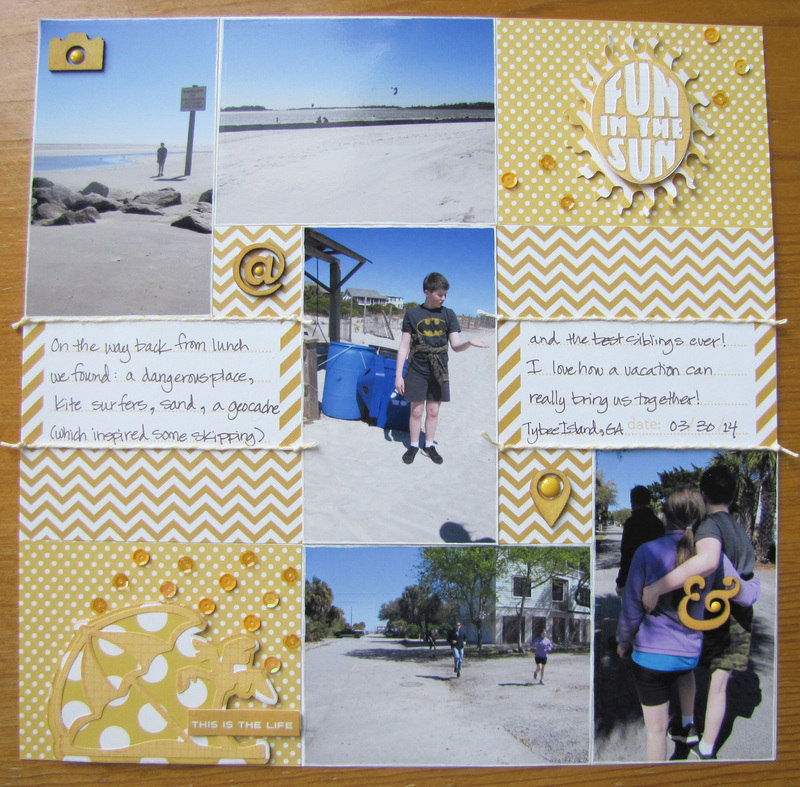 This project is my design team example for The Creative Cutting Challenge – Anything Goes! 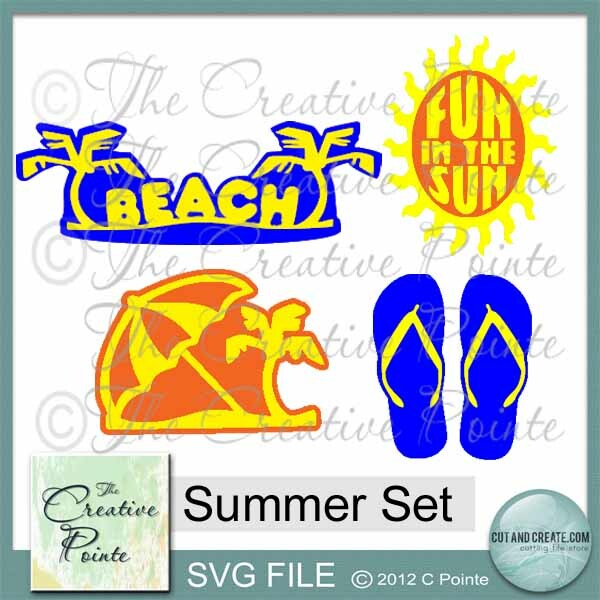 I used the Beach Set from The Creative Pointe! Gotta love these fun shapes! 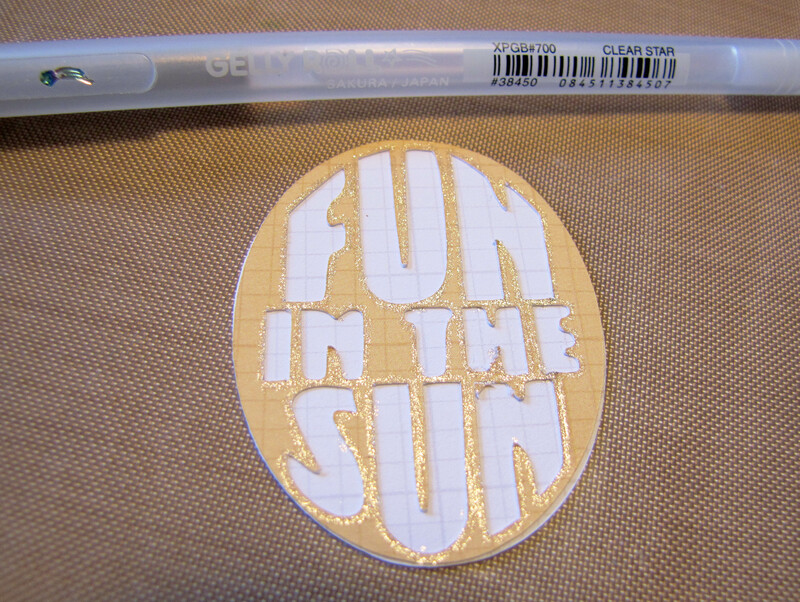 First I’ll show you how I embellished the die cuts. 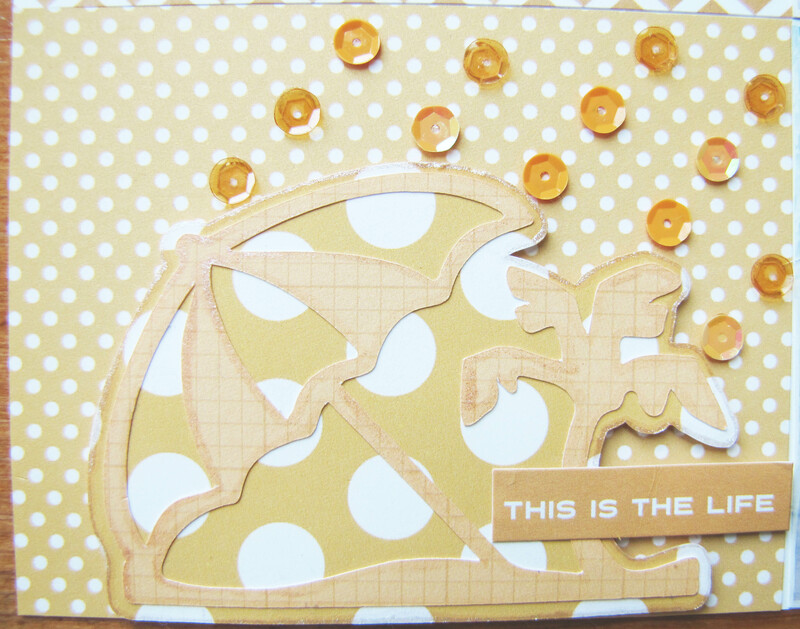 I was creating a monochromatic layout (for the challenges at Stuck on U Sketches and Scrap Our Stash – Stash Challenge #15 – Monocromatic LO) so I needed to find ways to make the die cuts pop since there was no real change in color. 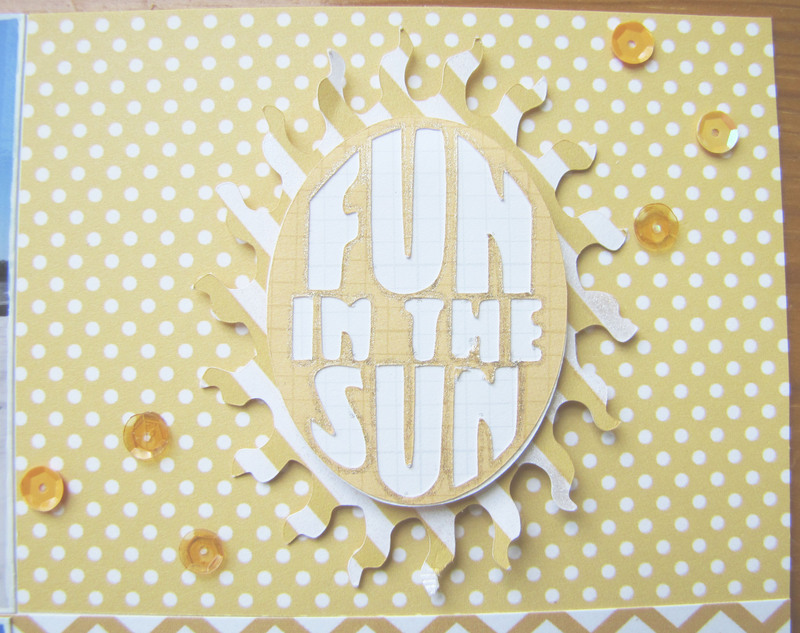 I used the Clear Star Jelly Roll pen (which has a gold sheen to it) to edge my title words – I think it worked perfectly for the sun! and the Smooch Illuminate Pearlized Top Coat on the white stripes in the sun rays and to edge the beach scene cuts and shadow layers. After using dimensional adhesive to attach the die cuts to the Project Life style cards I’d cut, I used some Doodlebug sequins and a phrase sticker to add some more interest to them! I love how these turned out and since I like to try and get more dimension and texture into my layouts, by making my own cards that was easy and fun to do! I love how my grid flows from the start to the end of the story, how the yellow is such a beautiful contrast to the blues and lavenders in the photos and how I was able to get so many pictures in and all at a size that made it easy to enjoy these images from our vacation. I hope you’ll play along if you’re able to cut from electronic files on a digital die cut machine (projects with only Cricut cartridge cuts are not qualified to participate.) Maybe you’ll even try to make your own Project Life style cards for your projects! Thanks so much for visiting! Remember, to put a smile on my face, simply leave a comment below! I hope you have a great day!!! Sketch N Scrap Birthday Bash Challenge hosted by My Creative Endeavors – Card Challenge : I used one Project Life style card (cut in half) for the journaling and created 2 more cards from scratch! Thanks for the inspiration! Products I used (not already mentioned): Patterned Paper, phrase sticker – Simple Stories; Digital Die Cut machine – Silhouette Cameo; Wood veneer – Studio Calico; Enamel Dots – Doodlebug; Twine – The Twinery; Pens – American Crafts and Sakura; Ink – Close to My Heart; Adhesive – Beacon, Glue Dots, Kuretake, Scotch, ScraPerfect.